You would hardly expect the 2019 Chevy Spark to be associated with Orlando, FL much less have it considered so favorably here as one of the most affordable, ideally sized subcompacts on the market. People young and old generally associate the city of Orlando located in central Florida with its massive theme parks. We are talking about monumental shows, towering rolling coasters, jumbo-sized treats, and the biggest of dreams all coming true in this one city. So how does a 12 foot, four-seat hatchback get any notice in such an oversized city? By continuing to play into the Spark’s strengths in a smaller size, striking affordability, and standard available features that all have a unique appeal to the urban driving community. Unbeknownst to most non-resident of Orlando, “The City Beautiful’s” downtown area has experienced significant growth with over 60% increase in residential population since 2000; the construction boom, replete with residential units, business development, and skyscrapers, has made Orlando the 26th largest metropolitan area in the country and a magnet for the incoming millennial workforce. The land of retirees is smack dab in the middle of a facelift; And what better way to maneuver around all those big city detours of your growing city than in a hip, subcompact hatchback with a sleek, colorful design from Carl Black Orlando dealership. With a base MSRP of $13,220, the 2019 Chevy Spark comes at a price tag that appeals to both young professional upstarts and downsizing empty nesters without sacrificing the comfort and technology of pricier modeled vehicles. It’s the perfectly priced fresh out of college vehicle for the driver who still wants to make a stylish statement with little start-up in the bank, and it’s the ideal cut the cord ride for empty nesters looking to trade in that bulky SUV for the simpler life of with attachments — two ever increasing demographics in the growing downtown Orlando area and one affordable subcompact available at Carl Black Orlando. The 2019 Chevy Spark offers efficiency and style without sacrificing cutting-edge technology or excellent safety. The Chevy Spark has been called many names since its first generation launch in 2008. Some negative, most positive, and all primarily in reference to its size. The automotive industry “playground” can be a rough place. That's ok; we can take it. Because when it comes to the city life, we are here to tell you that size does matter, and small is king. Stretching just 143 inches in length with a 94-inch wheelbase, the 2019 Chevy Spark is ready to hit the streets with a redesigned chrome-accented grille, front fascia, and headlights allowing you to make an even bolder entrance in the smallest of parking spots. Speaking of bold, the Spark is available in 10 bold exterior colors as well allowing a level of personal customization dependant on your personality type. The palette of vibrant colors continues to expand this year including Orange Burst Metallic, Passion Fruit, Caribbean Blue Metallic and Raspberry. And if color isn’t necessarily your customizable approach, Chevy also offers the beefed-up Spark Activ for a more noticeable, adventurous appearance upon entrance. The Spark Activ sits .2 inches higher than the rest of the lineup with SUV style additions including a roof rack and larger fog lights. 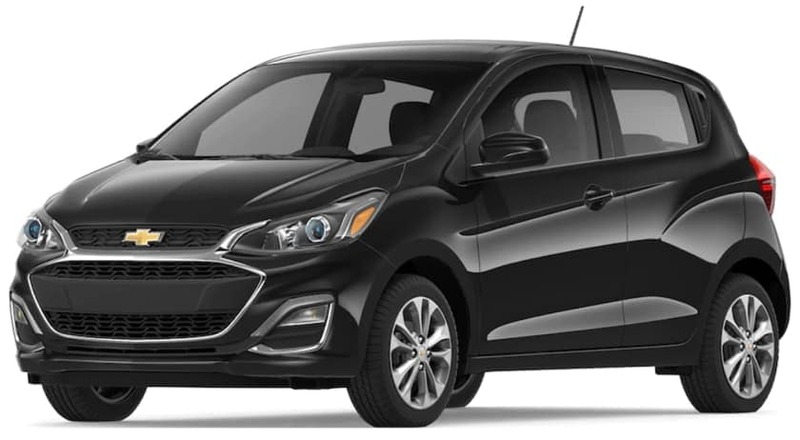 Unlike most subcompacts that appear stunted in growth, the Spark opts for a modern hatchback design that adds a certain sporty edginess and length that is both aesthetically visually pleasing and functional. With the rear seats in use, the Spark’s trunk capacity measures in at 11.1 cubic feet; that space expands more than double to 27.2 cubic feet when the rear seats are folded away. You may no longer be the first call on moving day, but you’ll have plenty of room to pick up lunch for all the hard workers. The trunk space offers plenty enough storage room to tackle trips to the grocery store, handle holiday shopping sprees, or to accommodate luggage for a weekend trip for two. Under the hood, the front wheel drive 2019 Chevy Spark is fueled by the same efficient 98hp 1.4L four-cylinder engine as the previous year. The available horsepower remains the same but still nothing to scoff at in a subcompact vehicle; especially since the current model marked a comparable 17% increase in horsepower from the previous Spark generation. The little engine that could packs more than enough punch for the stop and start between traffic lights and keeping above pace with city driving. Chevy continues to abide by the if it ain't broke, don’t fix it design mentality. And the fuel economy the Spark offers definitely isn't broken! With standard five-speed manual transmission or optional CVT, the Spark delivers an EPA-rated estimated mileage of 30 mpg in the city and 38 mpg on the highway. The hatchback handles nicely on the open road and is very responsive gripping well to the corners of the paved road even on the sharper turns. But where the Spark truly begins to shine is in busier urban environments. Zipping in and out of traffic, around tight city street corners, and down narrow, car parked alleys; these are the roads where the Spark’s small size really begins to take the advantage over other vehicles. And yes, parking! Probably the most quoted asset of the Spark mentioned at least once in every review, available parking options significantly increase given the Sparks decreased size. But parking accessibility aside, the number one perk you’ll soon come to realize is just how much fun it is to drive. Available in 4 trim levels, the 2019 Spark manages to be Chevrolet's most affordable passenger vehicle. Even at the base trim level, the Spark LS comes fully equipped with two USB ports, 7-inch touchscreen, Bluetooth capability, 4G LTE hotspot, Android Auto and Apple CarPlay. An upgrade to the 1LT will add on a bit of luxury with 15-inch alloy wheels, power windows and locks, cruise control, keyless entry, heated and power side view mirrors, LED daytime running lights, and SiriusXM satellite radio. The Spark’s top 2LT trim provides aesthetic upgrades to the interior and exterior with leatherette seating and a leather-wrapped steering wheel accented with silver, an upgraded instrument cluster display, and exterior chrome trim; a handful of ease of entry access gadgets are also included such as a proximity key, push-start ignition, and rear parking sensors. As far as the Spark Activ, it operates on its own plane of existence as the world’s smallest sport utility crossover. Building on the Spark 1LT model as a base, the Activ edges for a more outdoor, rough and tumble appearance with 15-inch alloy wheels, a revised suspension with 0.4-inch lift, fog lights, roof rails, and heated black leatherette front seat. A sunroof is optional for the top two trim levels; And at the 2LT level, you get the option to include a forward collision warning system with low-speed emergency automatic braking and a lane departure warning system. Aside from the additional safety measures afforded at the 2LT trim level, the 2019 Chevy Spark offers premium technology even at the base LS model. The Chevrolet Infotainment Systems integrates seamlessly with all your mobile devices allowing you to focus on the road; the placement of the touchscreen seems organic rather than distracting while the user-friendly system interface appears intuitively user-friendly. Aside from entertainment options of Apple CarPlay and Android Auto connectivity, you can also get onboard Wi-Fi through the OnStar system. People generally tend to assume that all subcompact vehicles are unsafe given their smaller size and stature; as if more leg room and a roomier trunk were all the necessaries required to avoid bodily harm when safely crashing vehicles into one another. Let’s see then, room for legs: check; spacious trunk: check. The 2019 Chevy Spark meets both those requirements in the sidewalk safety survey, but their high safety record probably has more to do with the unprecedented 10 airbags, anti-lock brakes, stability control, and high-strength steel safety cage that come standard in every Chevy Spark. In IIHS testing, the Spark received the highest rating of Good in the moderate overlap front and side crash tests. And Chevrolet continues to show that driver’s safety is the main priority by offering the Driver Confidence package in the Spark 2LT. The package consists of what is quickly becoming industry standards in safety with automatic emergency braking as well as forward collision and lane departure warning systems. You spend most of your day trying to safely navigate the contradictions that threaten to complicate your day further. Downsize excess but upgrade annually. Reduce, Reuse, Recycle but buy in bulk. Family first and yet work hard to get ahead. The main appeal of the 2019 Chevy Spark is its offer of simplicity; efficiency and style without sacrificing cutting-edge technology or impeccable safety. Big things really do come in small packages! Life is already plenty full of mixed messages so why purchase yet another contradiction. You need a simplified process from a dealership functioning on a unified front of singular purpose: to streamline your needs as a driver and simplify the purchase of the car you deserve. 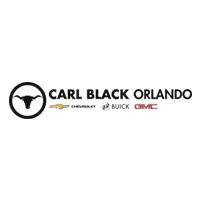 Carl Black of Orlando is the family owned and operated Chevrolet dealership that can provide that experience for you.